This is the third one in the Braun Series 9 9050cc and comes with the newly developed Cleaning and Charging Dock and some new exciting features. Braun shavers are well-known for their longevity and the performance that it can serve for a long period of time. There is hardly any problem with this shaver that will make you want to buy a different shaver. This new Braun Series 9 shavers are slightly heavier and have bigger shaving heads, but, it is not a matter of concern because it will perfectly fit in your hand. The first shave will be enough to open your eyes because it will show you an amazing performance and quality compared to what you have seen from some of the other best electric shavers. This Braun Series 9050cc shaver will take only half of the time to shave your facial hair than other shavers on the current market. – Great SyncroSonic ultra modern technology for capturing hairs from any part of the face no matter how tough they are. – The pivoting and extremely flexible head can follow any ups and downs of the facial contour and give excellent performance. – Like all other top Braun Shavers this model has also come out with the Hyper-Lift technology which is very effective in cutting the tough, low-lying hairs. This shaver uplifts those hairs and cut them from the very root successfully. – Clean and Charging dock is a plus point for this shaver as it can clean the shaver thoroughly. It not only removes all the hairs from the shaver head, but it also dries it out very nicely. This can also work as a charging station which can recharge the shaver battery within a very short time period. Most of all, it keeps the shaver clean and ready for the next use. – You will get a leather pouch which will protect your shaving device from any harm while you are not using it. – Battery life indicator is a helpful addition of this model with a numerical display, which can also show the status of hygiene. A travel lock system is very necessary while traveling and this shaver does have this feature. This shaver will definitely enhance the beauty of your bathroom because it has a great design and very shiny finish. It has greatly improved after the success of Braun Series 7 790cc. The most significant change has been made in the sound. 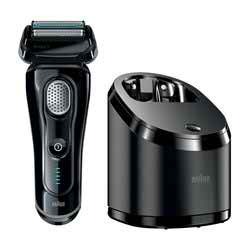 The Braun Series 7 799cc shavers are far noisier than this Braun Series 9 shaver. It produces only a little humming sound which is bearable. Another change that makes this Braun Series 9 9050cc model better than any other shaver is that it’s cleaning station does have a fan that dries out the shaver and cleans and washes away all the harmful germs from the shaver and keeps it safe and ready for the next use. A major problem that keeps the Braun series shaver a little backwards was the sideburn cut, but the new improved head of the shaver is very effective in cutting those sideburns with great expertise. Battery life is very long and the charge remains for 7 days, even you use it for 15 min every day. The battery can be recharged fully in only 60 minutes. You will never face any skin irritation, razor burn, nick or hair plucking. Nice and close shave even with the roughest beards. Cleaning is very simple and hassle free as you just need to keep the shaver in the cleaning station and the station will do the rest. Very easy to use and great look. Very expensive and maintenance cost is also high. It is not really that good for sideburns as the shaving head is large and problematic to operate near the ears. Shaving result is excellent, but not perfect, though nothing in this world is perfect. The Braun is a German shaving kit manufacturing company and dominates the shaving industry for a long period of time. Their product is designed to last a long time. The price looks expensive, but when you can use the product year after year, then it seems more reasonable than best electric shavers of 2018 which are not well-known or long lasting. So I can’t see any alternative of this premium Series 9 9050cc shaver from Braun which can ensure you a clean and close shave without any complications and protect your precious skin. Finally, this is actually a premium product which can satisfy any user. The only thing that’s a matter of concern is the price of this product. This Braun Series 9 9050cc is quite expensive for the general public. If it’s not a concern then there is no other competitor of this shaver in the current market. You can rely on this shaver even if you close your eyes. 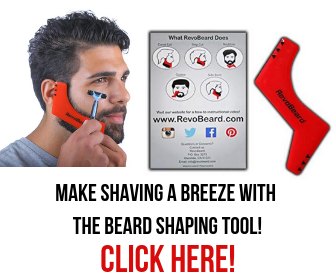 I guarantee that after buying this outstanding shaver you will never regret it.